As Polls Show Support For Gun Control, Calif. Gun Show Is A Hit : The Two-Way One month after the Newtown, Conn., school shootings, gun control is on the national agenda. The White House will outline its proposals this week, and national surveys are showing a majority of Americans support options such as requiring background checks for both private and gun-show sales. 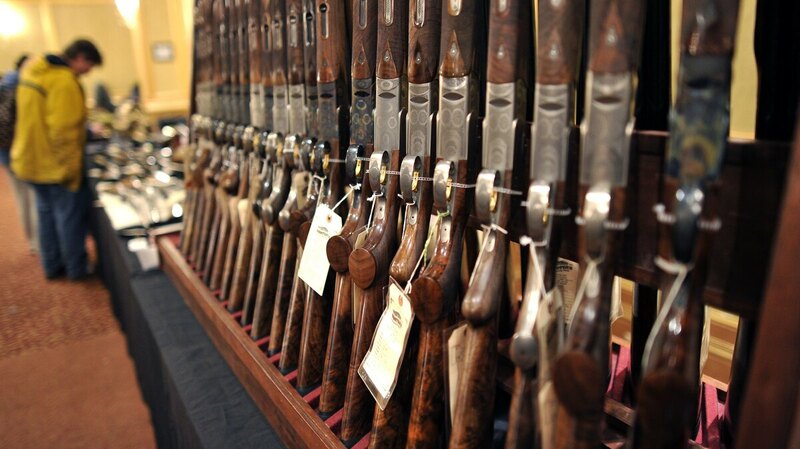 Shotguns sit on display at a gun show in Stamford, Conn., last week. Demand has risen for firearms as the White House prepares its new plan for gun control measures. New surveys find that a majority of Americans support some measures. One month after the Newtown, Conn., school shootings, gun control is on the national agenda. The White House will outline its proposals this week, and national surveys find a majority of Americans support options such as requiring background checks for both private and gun-show sales. As NPR's Richard Gonzales found when he visited a large traveling gun show this past weekend, it seemed that the momentum behind new gun control proposals had brought a spike in business for gun sellers. The San Francisco Gun Show was held at the Cow Palace, where Richard reported seeing "a line of a couple thousand people winding through the parking lot. And the line of cars to get into the parking lot is six blocks long." He spoke to an attendee about the show's draw this year. "Everybody is freaked out right now. So who knows?" hunter Robert Gonzales tells Richard with a sigh. Asked to explain, Gonzales answers, "They're freaked out that they're not going to be able to buy weapons I guess, you know. Cuz I been coming to this Cow Palace for years and I've never seen it this bad." President Obama said Monday that he will unveil the White House's plan later this week; he was to meet with Vice President Biden today, to discuss the options Biden's gun control task force is recommending to the president. "Some of them will require legislation," Obama said. "Some of them I can accomplish through executive action." According to two national surveys released today, a majority of Americans support creating a federal database to track gun sales, requiring background checks for gun-show sales, and increasing the number of armed guards at schools. Background supports drew the most support in the Pew Research Center for the People and the Press survey, with 85 percent in favor. The survey also found that 64 percent supported putting more armed guards or police in schools. Another study, from The Washington Post and ABC, found similar result, with 52 percent of those responding said the Newtown shootings made them more likely to to support gun control. And both surveys found that more than 50 percent of Americans support banning assault style weapons. On today's All Things Considered, Pew Director Michael Dimock tells Audie Cornish that despite the broad support, some of the options spur deep partisan divides. For instance, "among Republicans, you get fewer than half who would favor a federal government database on guns," he says. By contrast, 84 percent of Democrats are in favor. And 44 percent of Republicans support a ban on assault weapons, while 69 percent of Democrats say they would support such a ban. Similar divides exist on the issues of banning semi-automatic weapons and ending the sale of ammunition online. In Metairie, La., where Mike Mayer owns the Jefferson Gun Outlet, Mayer tells Richard that many of his customers are looking for the semi-automatic AR-15 rifle, like the one used in the Newtown shootings. "For a standard AR, something that we would sell normally for $899 is selling right now for $1850," Mayer tells Richard.